I was recently introduced to the Riceinfo.com, and noticed they have some great gluten free recipes. For the next three Friday's, Gluten Free Edmonton will be featuring the top three gluten free recipes from Riceinfo.com. Try them on the weekend! Whisk together oil, vinegar, basil, salt and pepper in large bowl. 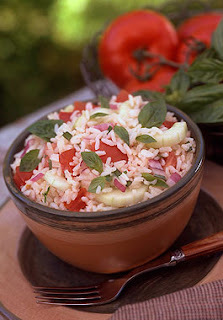 Add rice, tomatoes, cucumber and onion; toss. Serve chilled. *Substitute 1 tsp (5 mL) dried basil for fresh. It. Was. Amazing. I will make this again and again. It was easy and uses many of my farmers market stapled!